What is the purpose of ear tubes? What are risks and complications of ear tubes? What to do the day of surgery? Recurrent ear infections may require insertion of ear tubes. Ear tube placement involves a tiny incision in the ear drum. It is helpful to understand what to expect before, during, and after surgery. Ear tubes can have complications, it is important to follow of the doctor's directions following surgery. Middle ear infections (otitis media) are common in children. 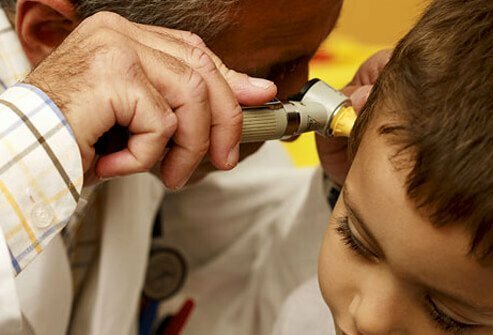 When a child has repeated ear infections or fluid build-up in the ears that do not go away easily or there are hearing problems or speech delays, a doctor may recommend surgery to insert an ear tube to allow the eardrum to equalize the pressure. The surgery, called a myringotomy, is a tiny incision in the eardrum. Any fluid, usually thickened secretions will be removed. In most situations, a small plastic tube (a tympanostomy tube) is inserted into the eardrum to keep the middle ear aerated for a prolonged period.. These ventilating tubes remain in place for six months to several years. Eventually, they will move out of the eardrum (extrude) and fall into the ear canal. Your doctor may remove the tube during a routine office visit or it may simply fall out of the ear. Less common conditions that may call for the placement of ear tubes are malformation of the eardrum or Eustachian tube, Down's syndrome, cleft palate, and barotrauma (middle ear injury caused by a reduction of air pressure), according to the American Academy of Otolaryngology. Failure to resolve the ear infections. Thickening of the eardrum over time, which affects hearing in a small percentage of patients. Persistent perforation after the tube falls out of the eardrum. While not a complication, some patients may have a need for further and more aggressive surgery such as tonsil, adenoid, sinus, or ear surgery. In most situations, the surgery is performed as an outpatient (no overnight stay usually required), at either the hospital or an outpatient surgery center. An anesthesiologist will monitor your child throughout the procedure. Usually, the anesthesiologist reviews the medical history before surgery. If your doctor has ordered preoperative laboratory studies, arrange to have these done several days in advance. If your child is old enough to understand what surgery is, be honest and up front as you explain the upcoming surgery. A calming and reassuring attitude will greatly ease your child's anxiety. Most children will feel better having had the pressure relieved in their ears. Your child must not eat or drink anything 6 to 12 hours prior to their time of surgery; this includes even water or chewing gum. Anything in the stomach increases the chances of an anesthetic complication. If your child is sick or has a fever the day before surgery, call the office. If your child wakes up sick the day of surgery, still proceed to the surgical facility as planned. Your doctor will decide if it is safe to proceed with surgery. However, if your child has chickenpox, do not bring your child to the office or to the surgical facility. It is important that you know precisely what time you are to check-in with the surgical facility, and that you allow sufficient preparation time. Bring the required papers and forms with you, including the preoperative orders and history sheets. Your child should wear comfortable loose fitting clothes (pajamas are permissible). Leave all jewelry and valuables at home. They may bring a favorite toy, stuffed animal, or blanket. Your child may be given a medication to help him or her relax prior to entering the operating room (premedication). In the operating room, the anesthesiologist will usually use a mixture of gas and an intravenous medication for sedation. During the procedure, which typically takes 10 to 15 minutes, your child will be continuously monitored including pulse oximeter (oxygen saturation of blood) and cardiac rhythm (EKG). The surgical team is prepared for any emergency. In addition to the surgeon and the anesthesiologist, there will be a nurse and a surgical technician in the room. After the anesthetic takes effect, the doctor, using an operating microscope, makes a tiny incision in the eardrum through the outer ear canal. There will be no external incisions or stitches. Fluid will be suctioned from the ear, and a tube inserted in the eardrum. Usually, drops will be placed in the ear, and a cotton plug inserted in the ear canal. An appointment for a follow-up ear check-up is usually arranged 14 to 28 days after the procedure. At this visit, the position and function of the tubes will be assessed. Usually, eardrops will be given to you the day of surgery. The surgeon will often place the same drops in the ear following the placement of the tubes. They are usually used after surgery for three days (3-4 drops each ear 3 times per day). If there is drainage from the ear after three days, you may be instructed to continue using the drops until the day before your office visit or as per doctor's instructions. Discontinue these drops if they cause severe pain or a skin rash. You can "pump" them into the ear by pushing on the soft cartilage tissue located in front of the ear canal (medically termed the tragus). Ear drainage may occur immediately after the procedure or at any time while the tubes are in place. Yellow clear fluid or mucous may drain for several days to weeks after the surgery. It is not unusual to see a bloody discharge following surgery. Cotton can be kept in the ear canal and changed as needed to keep dry. If after the immediate post-operative period, profuse, foul-smelling discharge drains from the ear, an infection is the possible cause. If this occurs, begin by using eardrops for three days. If the drainage continues beyond three days, call the doctor to determine if additional medicine and/or an office visit is necessary. Avoiding water for children with ear tubes or routine water precautions (wearing earplugs or headbands) is generally not recommended while tubes are in place with some exceptions. Water protection may be needed if pain results when the ears get wet, if there is prolonged drainage from the ear or for children who dive more than 6 feet under water, dunk their head in soapy bath tub water, or swim in areas other than chlorinated pools. There is an increased risk of infection in lake or pond water, as opposed to chlorinated water found in swimming pools. Follow your doctor's advice regarding water precautions. Tympanostomy tubes usually stay in place from 6 to 18 months. If they stay in longer than two to three years, they may need to be surgically removed. It is important to have an ear check-up about every six months during this period. An audiogram is usually obtained at some point after the ear has healed. The tubes eventually fall out of the eardrum as the ear heals. Some children may have mild discomfort or bloody drainage at this time. The small hole in the eardrum at the old tube site usually heals within several weeks. Your doctor will instruct you when it is safe to allow water in the ears. In some cases, insertion of ear tubes must be repeated if the tubes fall out and symptoms recur. REFERENCE: Reilly, B, K, MD. et al. Ear Tube Insertion. Medscape. Updated: Feb 05, 2016. Have you had success with ear tube placement? Please share your experience with ear tube problems. It may help others with a child with ear tube issues. How loud is too loud? Take this quiz to learn about your ears, how they function, and how to keep them healthy. Infections of the outer, middle, and inner ear usually are caused by viruses. Most outer (swimmer's ear) and middle ear (otitis media) infections can be treated at home with remedies like warm compresses for ear pain relief, tea tree, ginger, or garlic oil drops. Symptoms of an outer ear (swimmer's ear) and middle ear infection include mild to severe ear pain, pus draining from the ear, swelling and redness in the ear, and hearing problems. Middle and inner ear infections may cause fever, and balance problems. Inner ear infections also may cause nausea, vomiting, vertigo, ringing in the ear, and labyrinthitis (inflammation of the inner ear). Most outer and middle ear infections do not need antibiotics. Inner ear infections should be treated by a doctor specializing in ear and hearing problems. Can hearing loss be reversed? Take this quiz to find out! Take this home allergy quiz and test your knowledge on allergens, dust mites, pollens and more to see how allergy-proof your home is.